REUTERS/Gali TibbonIsrael’s Prime Minister Benjamin Netanyahu speaks during the weekly cabinet meeting at his office in Jerusalem July 6, 2014. 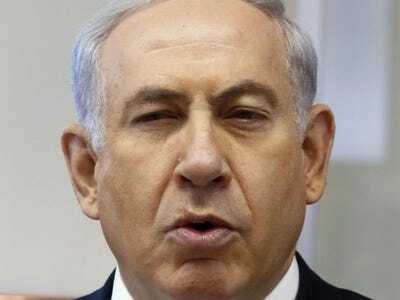 Israeli Prime Minister Benjamin Netanyahu appeared on CBS’ “Face The Nation” Sunday morning where he decried alleged cooperation between the US and Iran in the fight against the jihadist group Islamic State (also known as ISIS or ISIL). In addition to warning against military coordination, Netanyahu stressed Iran should not be allowed to keep or grow its uranium enrichment program through the P5+1 nuclear negotiations, which have a deadline of Nov. 24. Netanyahu said Israel is “fully coordinated” with the US in the fight against ISIS, which he characterised as a “global conflict” against jihadists. “The Middle East is awash with militant Islamists,” he explained. The Israeli leader was also asked about an interview published by The Atlantic last month where an anonymous Obama administration official was quoted referring to him as “chickens–t.” Netanyahu declined to directly respond to the quote, but dismissed speculation US relations with Israel have deteriorated.